We are preparing for quantitative aptitudes with the question-answer series for our upcoming competitive maths. Here, we take the most important math problems which have already asked in previous years competitive exam or a relevant question to perform well in the exam. 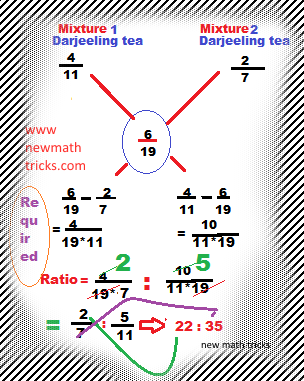 Look at below, we have solved some exam level arithmetic problems using math tricks. This is the 3rd tutorial on solved quantitative aptitudes. If you hadn't viewed previous two tutorials, then visit by clicking below. Solution: For the quick solution of this problem, we will use the Allegation method. Problem 2: Two trains 180 metres and 120 metres in length are running towards each other on parallel rails, the first one at the rate 65 km per hours and second at 55 km per hour. In how many seconds will they can be clear each other from the moment they meet? Solution: Here, we have to calculate the relative speed. As per the question both trains are not running in the same direction. So, the relative speed of both trains will be the sum of their speed. Relative speed =65+55=120 km per hours. And they have to cover the length of both trains. The sum of both trains length is 180+120 =300 metre. Problem 3: A furniture seller allows 4% discount on his marked price. If the cost price of an article is Rs. 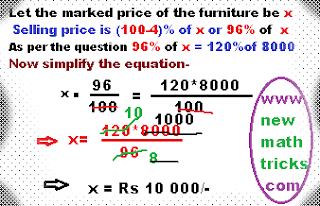 8 000 and he has to make a profit of 20%, then how many rupees have to mark as the price of the furniture? Solution: The ratio of value = 5:3:1 and ratio of numbers =10:12:10 or 5:6:5. Therefore, numbers of 50 paise coins = (5/16) *480=5*30=150. Number of 25 paise coins =(6/16)*480 =6*30=180. As ration of 10 paise coins and 50 paise coins are equal so it will be same. Therefore, the numbers of 50, 25 and 10 paise coin will be 150,180 and 150 respectively.